Homicides are piling up at a record pace in Uptown this year after a man was shot dead near Sheridan and Agatite Monday afternoon. The victim, a 20-year-old man, is believed to have been killed by members of the Black P-Stones street gang, according to a source. It's the second homicide in 16 days for Uptown, which also mustered up a non-fatal shooting in the interim. Murders are being recorded at the quickest pace since 2001, when Uptown experienced a double-homicide on March 10. But, no matter how many people are shot and killed, Alderman James Cappleman refuses to consider that rebuilding our police district's decimated manpower might save lives. (L): Cappleman; (R): Police officers looking for his dignity. 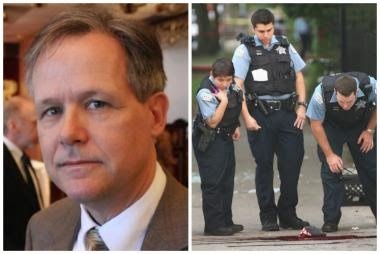 After an Uptown boy got shot in the head in September 2013, Cappleman went off of the "crime is down" reservation and said he would be "insisting on a commitment of more police officers on the street before we vote on the 2014 City Budget." But, days before the budget vote, Cappleman changed his mind. He claimed that he wanted more officers not because a boy had been shot in the head, but "because my concern was we could not address a lot of the chronic drinking. Especially around the first of the month, the drinking was terrible." The "boys-getting-shot-in-the-head" stats weren't too hot either, if ya ask us. Rather than more cops, Cappleman settled for a city program that was supposed to help the homeless. "I want to try this out. I want to see if it works." Needless to say, it's not working. After a single homicide in 2013, Uptown scored 5 killings last year and has scored two so far this year. Having zero shame, Cappleman told ward residents during his recent re-election campaign that he had "fought for & got a net gain of 29 officers" in the 19th district last year. As CWB showed on January 26, that was a flat-out lie. Cappleman failed to win a majority in the election and now faces a run-off against Amy Crawford. Every murder brings out another Band Aid from the alderman. "Foot patrol" officers are a favorite of his. Even though those officers go back to normal duties within weeks. He's right about one thing: Police officers alone will not put an end to Uptown's gang violence. But reversing the gang mentality is a generations-long process.Waddaya say we keep some cops around until it's fixed, James? 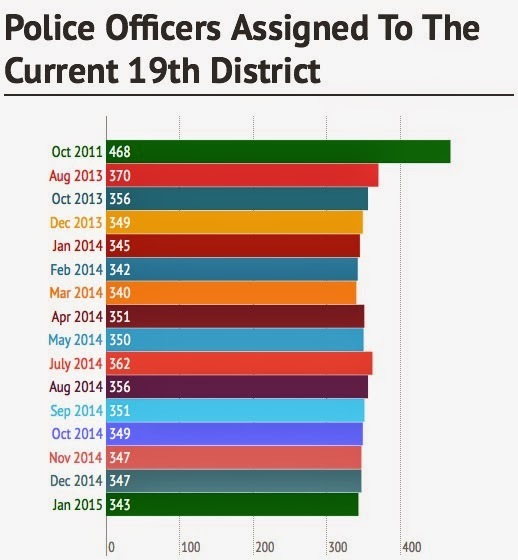 Since 2013, the 19th police district, which covers Uptown as well as Wrigleyville and Boystown, has lost nearly 27% of its officers. In January, the 19th district's headcount was on the cusp of an all-time low. You should've been at the CAPS meeting we went to in Uptown last week. A 19th district lieutenant actually told residents that they shouldn't be concerned about shootings in the neighborhood because down on the South Side "it's complete chaos." What kind of f'-in logic is that? Should they be concerned now that there's been another homicide? Exactly when should one become concerned about people being shot dead in their streets?